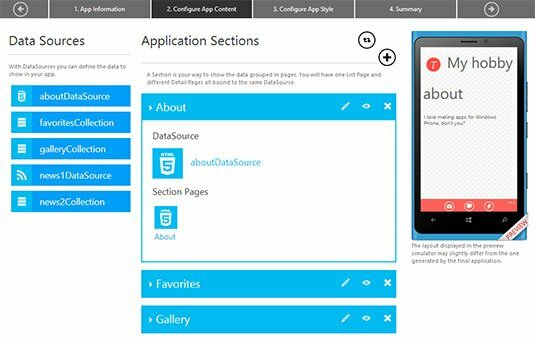 Microsoft has given a significant overhaul to Windows Phone App Studio Beta, its web-based tool for building simple apps for Windows Phone 8. Redmond has pitched the tool as a way for "hobbyists, enthusiasts and new developers" to build apps without programming. Specifically, it suggests App Studio is good for making "content-based apps" – a polite way of describing the kind of simple "brochureware" apps that are more about presenting information than doing work. "To date 350,000 developers of all skill levels have used Windows Phone App Studio Beta, resulting in 300,000 projects and 20,000 apps published to Windows Phone Store," Microsoft's Emilio Salvador Prieto said in a blog post. For the new version released on Thursday, Microsoft has given the UI a major scrubbing so that the workflow is faster and easier to use. The controls have also been redesigned so that they're more touch-friendly – perhaps for those who want to try their hands at designing phone apps on their phones. A new version of the built-in phone emulator supports dynamic text updates, so the emulated output changes on the fly with each change to the project files. A few new app templates for businesses have been added to the catalog, bringing the total number of preconfigured designs to 21. App Studio can also now convert JPEG images into PNG. Microsoft says the new version of App Studio outputs higher-quality code in terms of structure, readability, and performance. Generated apps are now based on the Model View ViewModel (MVVM) architectural pattern, a style developed by Microsoft that's largely derived from the better-known model-view-controller (MVC) pattern. Perhaps most interesting, however, is a new experimental feature that allows developers to output their projects both as a prebuilt app package for Windows Phone 8 and as a Visual Studio solution. The latter potentially allows developers to use Visual Studio to build versions of their Windows Phone apps as Windows Store apps for Windows 8.1. (Curiously, Windows 8 is not mentioned as a target.) But the fact that Microsoft is not doing the builds itself yet, as it does for Windows Phone, suggests the process may not be as straightforward as it seems. Still, adding this feature to App Studio is yet another example of Microsoft trying to unify the developer experience for Windows and Windows Phone. In November, Redmond made it possible to sign up for both developer programs simultaneously, and rumors say it plans to combine the online stores for both platforms sometime this year.